Yale offers more than 80 majors in a single undergraduate college including four distinct biology programs, ABET-accredited engineering majors, and unique interdisciplinary programs such as Ethics, Politics and Economics, and Ethnicity, Race and Migration. Students do not declare a major until after their second year. Students may double-major in any two fields. 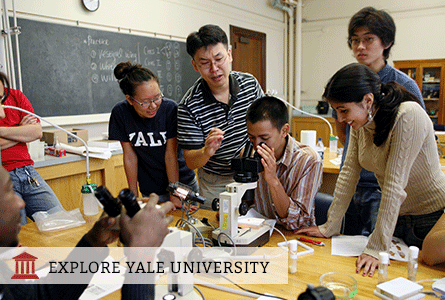 The student-to-faculty ratio is 6:1; 74% of Yale College courses enroll fewer than 20 students. 95% of undergraduate science and engineering majors conduct research with faculty. Yale has more than 800 labs that award more than $1 million in annual research fellowships for first-year students alone. Nearly 70% of students participate in international study, research and/or internships. The Yale Office of Career Strategy works with students starting in their first year to provide pre-professional advising, assistance with graduate school applications, and workshops and networking opportunities throughout the year. The STARS program supports women, minority, economically underprivileged, and other historically underrepresented students who pursue STEM fields.